Our pole barn plans are complete, easy to follow, and are accompanied by how-to tips and free technical support. Nothing is left to chance as everything needed to build the structure are included in our pole building plans including the quantity of fasteners to use in every connection (something offered only with engineer stamped plans by the competition). Here is a sample of the post plan offered with our industry leading pole barn plans. It provides the post spacing for the sidewalls and endwalls, post embedment technique to be utilized and post orientation. Notice that the plan measures each post spacing center to center except for the corner posts. Also the corner post spacing is 1 1/2″ less than the overall building dimension to leave room for the girts to be nailed around the building perimeter. 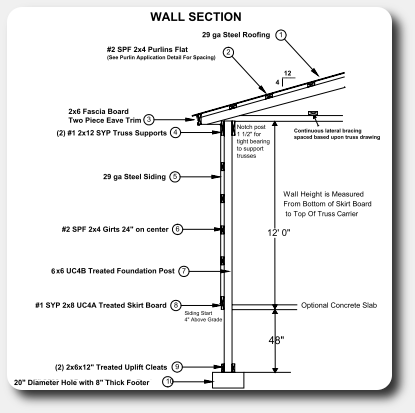 Also included are post orientation images to aid in setting your posts on the gable endwalls and eave sidewalls. 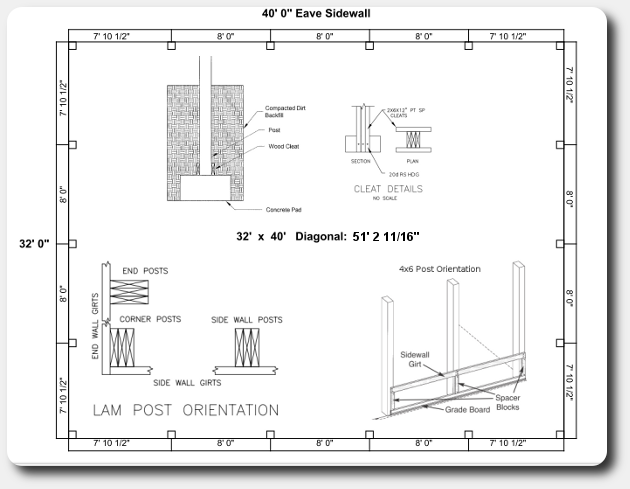 6×6’s are square so they aren’t shown but if your building includes 4×6 posts or laminated posts this is the orientation required for post setting. The images at the top show the post embedment technique utlitized and also the uplift cleats used to ensure your building doesn’t get jacked later on by a windstorm. Another drawing included in all pole building plans would be the bearing wall cross section. This drawing provides the necessary information for a permitting office to quickly see how the building will be constructed based upon the load requirements for the building site location. For the DIY builder it provides a snapshot of the detailed drawings to follow that describe the exact length and fastening requirements at each connection point. The drawing can be magnified to see the trim pieces utilized for overhang and every detail to be included in the building based upon the plan. We provide construction photos and free technical support for first time builders that need a little more explanation or just want to make sure they build their pole building exactly to specification. Leaving nothing to chance we provide the exact number of nails for each connection point. Truss supports and headers for large openings are calculated and each includes the exact number of ring shank nails to support the loading of the building based upon the span, opening width, opening location, number of plys, and snow load. Contact us today for information about our industry leading pole barn kits and plans or get your building erected and all doors and windows installed by us! I’m a class ‘A’ contractor and have an order for a residential 2 story 2 car garage with a framed in work shop. Due to the customers budget we intend to build a pole barn. The county requires stamped engineering drawings (Fauquier County Va.) because it is residential, not agricultural. I can provide the layout, can you provide the engineering drawings? Basic size and layoutis; 32′ x 40′. Gable end doors. (2) 12′ wide bays for the garage .From the right corner (looking at the building), a 10w x 12h garage door, to the left of that, a 8′ x 8′ garage door. To the left of that, a 16′ (by 32′) work shop with a 3/0 entry door. The ceiling height will be 8′ tall. The work shop will be framed and have stairs that allow access to the floor above the work shop. Kind of like a loft. 2 windows in the back gable wall of the garage (1) per bay. And (2) windows centered on each eve wall for the first floor, and a second window on the 2nd story only above the workshop. 1′ soffit on the back and eves, 2′ soffit on the front gable end (above all of the doors). The building will be metal sided and roofed. We sent you an email about this. Hi, we don’t offer a plan only service but can provide engineered plans with materials or installed buildings. 36 x36 4 stalls tack and hay room with loft enclosed above. Hi, if you email us the zip code of the building we can provide a price for a building package or installed building. I’m looking for a pole barn type 2 story with master down, two bedrooms and loft and bath upstairs. Do you guys offer just the plans ? I would like to diy my pole barn but the county says I need a set of plans with an NC stamp on it. Looking for a set of engineered plans for 60 X 120 pole barn construction riding arena with side windows that can open, one garage type door and a large enough door to walk a horse through. The building will be metal sided and roofed. Construction to be done in Ontario, Canada. Hi, I am sorry we don’t have any engineers to stamp plans in Canada, only in the US. I’m looking for sealed drawing for a 42×39 barn style building? Gerardo, please contact us with the details of your build so we can provide a bid for the building package, delivered and unloaded along with engineer stamped plans. Our office phone is (210) 650-2276 or you can contact us using our contact form with details using this link. Did you ever get your plans for your pole barn. I’m doing the same thing in Marian County near Ocala FL and they also requir a certified print engineer drawing. My building is the same 24x40x14 . How much did you pay for just the blue prints. I am looking for stamped plans as well. My county requires them as I would like to go the DIY route. It would be an agricultural barn being used for housing animals. 50x30x14 (LxWxH). Thanks in advance. Any info is greatly appreciated. Matt, engineer stamped plans (inlcuded in the building package) cost $600 for garage and farm buildings. Residential and commercial buildings are $900. It takes about 2 weeks to get the engineered prints completed to start the permitting process. Let us know if we can help. Also, if you need an engineer stamp for permitting please let us know so we include this in the price for the building package with plans and material list. We also unload all material on your jobsite. It takes about 4 weeks without engineer stamp and 6 weeks with one.